Ceres Greenhouse Solutions is now offering a new option for our greenhouses in the form of ETFE film. Widely used in Japan for decades but with little use in the United States, Ethelyne Tetrafluoroethelyne (ETFE) is a translucent polymer sheeting with great benefits for greenhouse production. 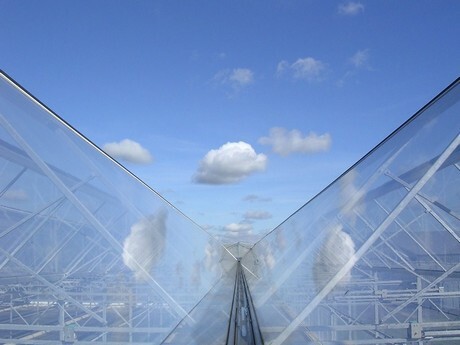 ETFE film allows for more than 95% light transmission, including the UV spectrum. Full spectrum light, especially UV-A, plays an important role in plant health and nutrition. In a natural UV environment, plants produce a higher number of protective compounds, like beta carotene, anthocyanin, and glycosides, that contribute to the color, flavor, and nutrition of many plant species. UV spectrum light also acts as a gentle radiation, cutting down on molds, fungi, and certain plant diseases in greenhouses. Researchers from the company have found that higher levels of glycosides and other protective compounds deter pests in some plant species. Only 1/100th the weight of glass, ETFE allows for wider truss spacing and, therefore, less shading in the greenhouse. ETFE can elongate up to 400% without breaking, making it a viable solution for locations that experience a lot of hail, high winds, or are prone to earthquakes. Ceres have different thicknesses of ETFE available (60 um – 300 um) based on site specific weather challenges. A typical polyethylene greenhouse will need to be re-sheeted every 3-5 years due to steadily lower light transmission levels. Data shows that ETFE will only lose 5% light transmission over 20 years. Additionally, ETFE has a nonstick surface, thus allowing snow to slide off very efficiently and it resists dust or pollen. ETFE can be installed in one or two layer configurations. The outer layer is thick (100-300 microns) to protect the greenhouse from the elements and is completely clear to allow up to 95% light transmission. The inner layer is able to be much thinner (60 microns). Both layers combined create a diffuse effect which eliminates shadows and scatters the light as it enters the greenhouse, allowing the light to penetrate the plant canopy.